What to say about my final semester with a full load of classes? Today I’ll not write on the classes themselves; my next post, the much-acclaimed annotated curriculum post, will deal more specifically with that aspect of my Fletcher experience. Instead, here I’d like to consider a pair of extracurricular events from the fall 2018 semester. 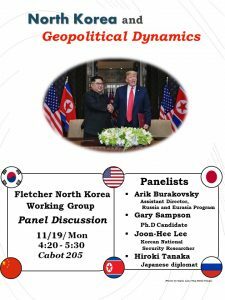 First, my opportunity to participate in a panel discussion at Fletcher focused on North Korea, and second, former Secretary of State John Kerry’s visit to Tufts in late November 2018. The panel I spoke on was hosted by Fletcher’s North Korea Working Group. The connection that allowed me to get onto the panel was brokered through one of my classes, P215 Nuclear Disorder. A fellow student, having heard that my dissertation research focused on North Korea, approached me and asked me if I’d like to participate. I knew that at some point in my doctoral studies I would reach the cross-over point between attendee and participant; this was it. The panel itself consisted of myself and three other Fletcher students. Each was asked to represent the non-official views of a country of which they were either a citizen or about which they had done significant research. For instance, the moderator and lead organizer, Hiroki, is a Japanese diplomat. Joon-Hee has worked for the South Korean Ministry of Defense. Arik studies Russia. And I am an American whose studies have touched on both China and North Korea. I was impressed with the turnout for the event. About 25 students attended. After the moderated questions prepared by Hiroki, there was a question and answer session with the audience. No one bit anyone else’s head off. It was civil, and opposing viewpoints were heard. I found it to be an enriching experience and came away even more impressed than I had been with the well-reasoned views and depth of analysis of my fellow Fletcher students, both those that served on the panel with me and those who came to watch and listen. I would do it again. The second event that added some color to my fall semester was a visit to Tufts by former U.S. Senator from Massachusetts and U.S. Secretary of State John F. Kerry. 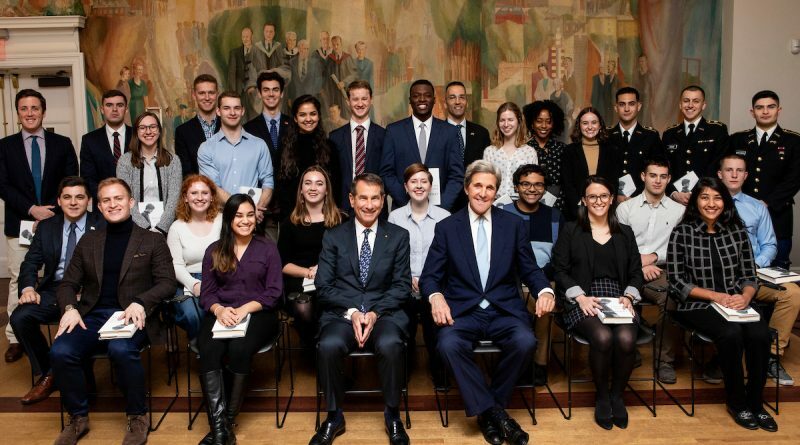 Kerry was scheduled to appear as a part of the Tisch College Distinguished Speakers Series, but before the public event, there was to be a smaller private gathering in which attendees selected from among various colleges and schools at Tufts would have a chance to interact with Secretary Kerry more informally. There ended up being about 25 students at the pre-session meet-and-greet. Not advertised in advance but a nice touch was that everyone was given a signed copy of Kerry’s new memoir, Every Day is Extra. To prepare before the event, I’d obtained a copy of the book from the library. I’d made it through the first few chapters discussing his early life and time as an undergraduate student at Yale. What struck me from this portion of the book was the enormous effect that President Kennedy’s assassination, which took place while Kerry was in college, had on his life. While those who weren’t alive in 1963 (like me) know that the president’s assassination was a hugely significant event, it’s different to hear from those who lived through it, and all the more so for someone like Kerry, the trajectory of whose life may have changed profoundly as a result of it. Kerry once had a chance encounter with President Kennedy at a Massachusetts beach house some years earlier, and I think that the personal connection they shared, while not a strong one, had to have made the president’s untimely death all the more impactful on young Kerry. Aside from noting how tall Kerry is in person, having a chance to hear Secretary Kerry’s candid views in this smaller venue was a great way to get a read on what’s important to him and to understand more about the things he’s dedicated his life to achieving. He’s had a fantastic career of service to the United States, and his path is one that today’s young people would do well to emulate. His military service, legal practice, legislative experience, and years as the nation’s top diplomat all combine to create a seasoned, impressive leader of substance. The public remarks that followed only served to reinforce my initial impressions, while the tenor and focus of the event reminded me of one of my most treasured memories of my undergraduate experience at Nebraska. Since 1988, the University of Nebraska has had an ongoing lecture series called the E.N. Thompson Forum on World Issues. Over the years, the forum has hosted noted speakers such as Mikhail Gorbachev, Maki Mandela, Elie Wiesel, Robert McNamara, Tom Friedman, Samantha Power, Michael Walzer, and many others, bringing these international-known voices and their views to the Great Plains of the United States. I attended these events regularly as an undergraduate and looking back, I now think of the forum as part of my early education on international affairs. It certainly helped set me on the path that I am now on as developing practitioner in this field. Kerry’s public event at Tufts reminded me very strongly of the positive experiences I had as an attendee at E.N. Thompson Forums throughout my undergraduate years. 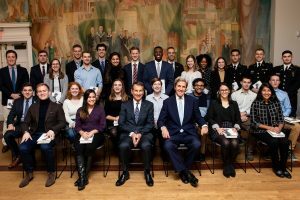 I hope that some of the young undergrads from Tufts who were lucky enough to snag a ticket to the Kerry talk end up “bitten” by the international affairs bug as a result of attending that event or others like it. It was also an excellent reminder to me not to become complacent in that at Fletcher we so often enjoy visits from notable international affairs speakers, to the point of almost becoming routine. It is certainly not like that everywhere, even just down the street from 160 Packard Avenue! ← You submitted your application: what now?